A direct descendant of Soledad Canyon pioneer Thomas Findley Mitchell, Minnie Ann Helvey Murphy was born Jan. 27, 1918 in Bouquet Canyon (although her birth certificate says Lang). Valedictorian of San Fernando High School in 1935, she earned her bachelor’s degree in elementary education from UCLA in 1939 and a master’s degree in education from San Fernando Valley State College (now CSUN) in 1968. She taught first grade in the Los Angeles Unified School District for 36 years. Minnie married Matthew Murphy on June 16, 1945, and moved from Saugus (now Canyon Country) to Newhall. The couple raised two beautiful children, Robert and Melanie. 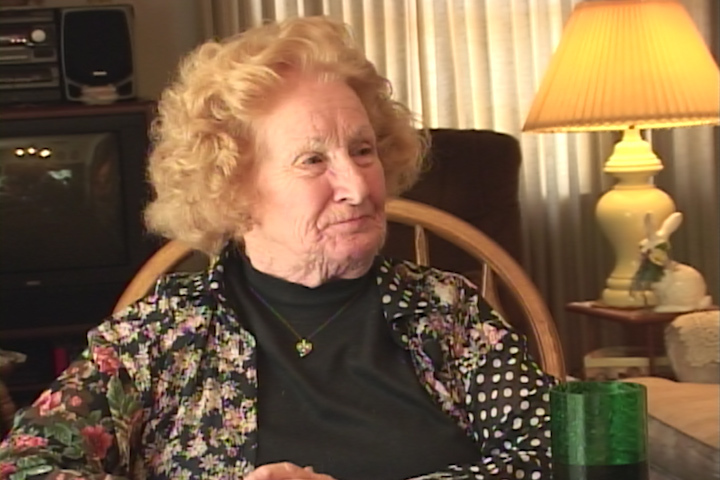 Minnie Murphy died Sept. 22, 2013, in Newhall. Filmed in 2002. Edited 2017. Such a vivacious lady, she must have been an excellent teacher, inspiring her pupils every day. What a treasure. Thank you for interviewing her. I am in tears. This woman was the best person to have ever lived. No one had a better grandma than I did. Thank you for editing this together Leon Worden.